hat better place to make your home than on MOUNTAIN TIME underneath these western skies? Douglas offers a variety of real estate ranging from old neighborhoods to rural living and most things in between. Kara Koss of The Koss Agency is quick to commend Douglas for the manner in which the community has been developed. 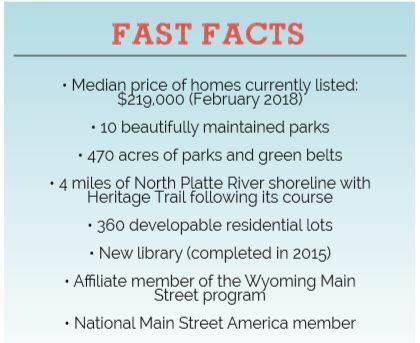 “Our community has very nice areas with homes that will hold their value long-term,” says Koss. In the wake of an economic downturn beginning in 2015, Koss is optimistic for what 2018 will bring and sees growth on the horizon. While it remains a buyer’s market with motivated sellers and low interest rates, several factors are indicating economic growth and expansion for the Douglas community. “There are 89 listings right now, however some of those are for homes to be built,” says Koss noting that the median price of those homes currently listed is $219,000. grow.” At present Koss says rental properties are readily available, but she believes that will change in the months and year ahead. Her beliefs are supported by the growing number of workers present in the Douglas community late 2017 and early 2018. While metropolitan America is home to entire lodging facilities that cater to demand during times of construction, Douglas’ more traditional lodging properties are accustomed to meeting this need within the community. Properties, listed at ConverseCountyTourism.com, are open to longterm contracts and in some cases have rooms that are more apartment like in the amenities they include. The community offers a wide variety of properties with a great deal of construction taking place in recent years. Workers in the area can choose between historic downtown and newer construction on the community’s edges. We could easily tell you how great Douglas’ real estate community is, but we thought it best to provide the numbers and let you contact them directly. You’ll undoubtedly hear a friendly, professional voice on the other end of the line. It’s just the way we do business on MOUNTAIN TIME. Did You Know? Douglas is home to one of the top golf courses in Wyoming, just one of the many recreational opportunities in the area.